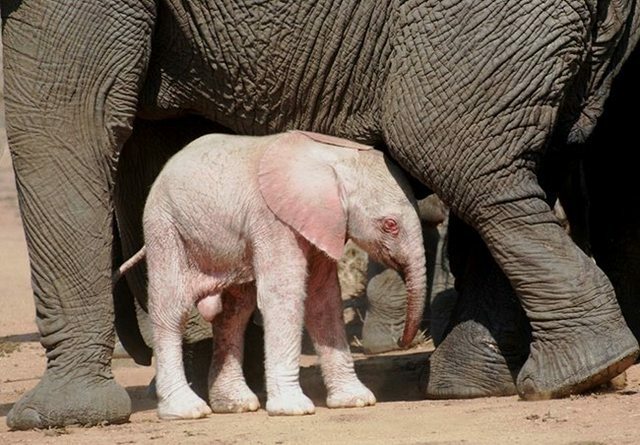 An extremely rare albino elephant has been seen in Kruger National Park in South Africa. The little elephant calf’s pink skin stands out in contrast with the grey skin of her mother and African elephants in her herd. The baby was been spotted by tourists near the Shingwedsi River, where the elephants were drinking and bathing. One person who saw the baby was 58-year old Nicki Coertze, who has been visiting Kruger Park since he was a kid. He said in all his years in the park he has never seen an albino elephant before, so he knew it was a once-in-a lifetime sighting and made sure to take as many pictures as he could. Albinism is caused by a lack of pigment in the skin. The condition also causes poor eyesight that could eventually lead to blindness, something common in albino animals. Albino animals can often be rejected by their own species because of their unusual appearance. Fortunately, this does not seem to be the case with this baby elephant. She appears to be fully accepted in the herd and is being cared by her mother. Take a look at the video below to see more photos of this extremely rare animal and share the story with your friends!